A remarkable discovery made at the Winston Barracks in Lanark. Whilst working at the Army Recruiting Office in Glasgow in 2017, Thomas Balloch, ex member of The Cameronians (Scottish Rifles) 26th & 90th was handed a very unusual envelope. "The envelope was found in a bottle by workmen while they were doing work on Winston Barracks main block in 2007" says Thomas. He continued "the following was written on the envelope: "Greetings to whoever finds this bottle. This was inserted into the wall on the 2nd of June 1939. Hitler is upsetting the peace of the world with his dictatorship" This is followed by three names John Fletcher, Edward Irons and Pat Quinn." "Presumably these men worked on the original construction of Winston Barracks and wanted to leave some kind of reminder." 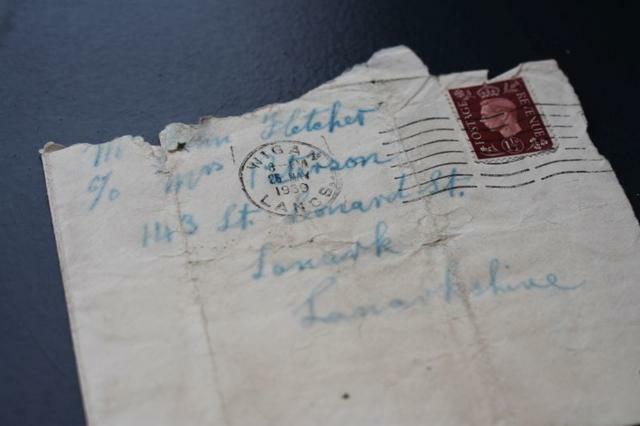 "The envelope was originally sent to Mr & Mrs Fletcher c/o Mrs Paterson 143 St Leonards Street, Lanark, so I presume John Fletcher had this with him that day and it was all he had to write on." The letter will be donated to Lanark Museum to contribute towards their local collection. Although local men from Lanark & Clydesdale had always served in the Cameronians, it was not until 1947 that the Regiment once again had a direct connection with Lanark. In 1936, £150,000 was set aside for the construction of a new headquarters for the Scottish Rifles. Building began at Lanark in late 1939 and the newly named Winston Barracks were completed by 1941. Lanark Community Development Trust are currently running a 'Cameronian Memorial Project' which has included the official naming of the roundabout at the Barracks, 'The Cameronian Roundabout' and there are plans to instate a memorial sculpture in the spring of 2019.